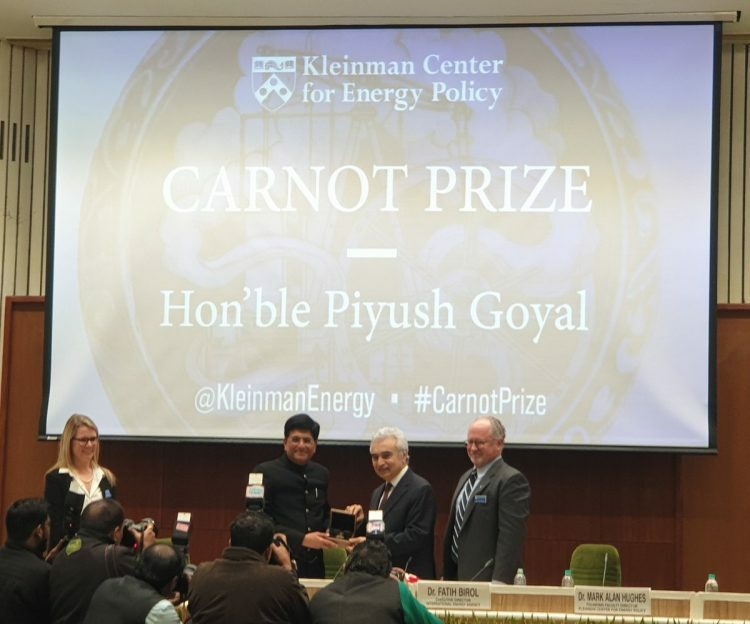 New Delhi, India —Today the Kleinman Center for Energy Policy at the University of Pennsylvania presented its fourth annual Carnot Prize for achievements in energy policy to the Honorable Piyush Goyal, India’s former minister of power and of renewables and current minister of railways and coal. The IEA reports that in the year 2000, less than half of India’s population had access to electricity. Now, more than 80 percent of the population has access to electricity. If this pace continues, India will have universal electrification by 2020, “one of the largest successes in the history of electrification,” said Birol. Goyal studied accounting and law at Mumbai University. In additional to public service, he was an investment banker and advised top corporations on management strategy and growth. He also served on the boards of the State Bank of India— the country’s largest commercial bank—and Bank of Baroda. Podcast Episode. Goyal talks with Energy Policy Now host Andy Stone about ending energy poverty and fighting climate change. Blog Post. As we reconvene in New Delhi to officially award the Carnot Prize, we find teaching moments in India’s journey to clean energy. Blog Post. As we reconvene in New Delhi to officially award the Carnot Prize, we explore India’s road to cleaner energy.